Dr. Al Hadad is Consultant Bariatric Surgeon and Chief of the Bariatric and Metabolic Surgery Centre at Healthpoint Hospital, Abu Dhabi, United Arab Emirates in collaboration with Imperial College, London, United Kingdom. A graduate of Baghdad Medical School, Baghdad University in Iraq, Dr. Hadad did his postgraduate training in General Surgery in Iraq and Jordan and became a Fellow of the Royal College of Surgeons of Ireland and Fellow of the Royal College of Surgeons of Glasgow. During his post graduate training in General Surgery he completed a Ph.D. in Clinical Epidemiology and Biostatistics from Jordan University of Science and Technology in Jordan. 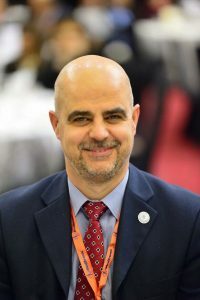 Member of the International Federation for the Study of Obesity and Metabolic Disorders (IFSO) and has served as General Secretary of the Emirates Society of Laparo-Endoscopic Surgeons (ESLES). He has publication in peered reviewed journals related to bariatric surgery and surgical endoscopy.